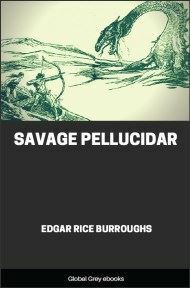 This is the third book in the Pellucidar series by Edgar Rice Burroughs. 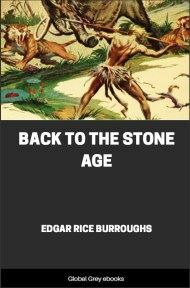 In this adventure, Tanar, a young chief, and the cave girl Stellara, struggle for survival against a myriad dangers. Jason Gridley is a radio bug. Had he not been, this story never would have been written. Jason is twenty-three and scandalously good looking—too good looking to be a bug of any sort. As a matter of fact, he does not seem buggish at all—just a normal, sane, young American, who knows a great deal about many things in addition to radio; aeronautics, for example, and golf, and tennis, and polo. But this is not Jason's story—he is only an incident—an important incident in my life that made this story possible, and so, with a few more words of explanation, we shall leave Jason to his tubes and waves and amplifiers, concerning which he knows everything and I nothing. Jason is an orphan with an income, and after he graduated from Stanford, he came down and bought a couple of acres at Tarzana, and that is how and when I met him. While he was building he made my office his headquarters and was often in my study and afterward I returned the compliment by visiting him in his new "lab," as he calls it—a quite large room at the rear of his home, a quiet, restful room in a quiet, restful house of the Spanish-American farm type—or we rode together in the Santa Monica Mountains in the cool air of early morning. Jason is experimenting with some new principle of radio concerning which the less I say the better it will be for my reputation, since I know nothing whatsoever about it and am likely never to. Perhaps I am too old, perhaps I am too dumb, perhaps I am just not interested—I prefer to ascribe my abysmal and persistent ignorance of all things pertaining to radio to the last state; that of disinterestedness; it salves my pride. I do know this, however, because Jason has told me, that the idea he is playing with suggests an entirely new and unsuspected—well, let us call it wave. 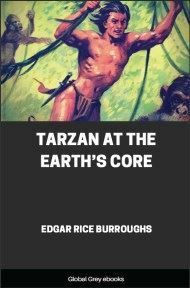 He says the idea was suggested to him by the vagaries of static and in groping around in search of some device to eliminate this he discovered in the ether an undercurrent that operated according to no previously known scientific laws. At his Tarzana home he has erected a station and a few miles away, at the back of my ranch, another. Between these stations we talk to one another through some strange, ethereal medium that seems to pass through all other waves and all other stations, unsuspected and entirely harmless—so harmless is it that it has not the slightest effect upon Jason's regular set, standing in the same room and receiving over the same aerial. 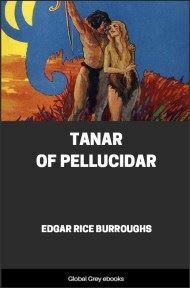 But this, which is not very interesting to anyone except Jason, is all by the way of getting to the beginning of the amazing narrative of the adventures of Tanar of Pellucidar. Jason and I were sitting in his "lab" one evening discussing, as we often did, innumerable subjects, from "cabbages to kings," and coming back, as Jason usually did, to the Gridley wave, which is what we have named it. Much of the time Jason kept on his ear phones, than which there is no greater discourager of conversation. But this does not irk me as much as most of the conversations one has to listen to through life. I like long silences and my own thoughts. Presently, Jason removed the headpiece. "It is enough to drive a fellow to drink!" he exclaimed. "I am getting that same stuff again," he said. "I can hear voices, very faintly, but, unmistakably, human voices. They are speaking a language unknown to man. It is maddening." "Mars, perhaps," I suggested, "or Venus." He knitted his brows and then suddenly smiled one of his quick smiles. 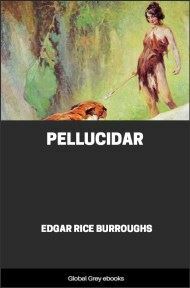 "Or Pellucidar." I shrugged. "Do you know, Admiral," he said (he calls me Admiral because of a yachting cap I wear at the beach), "that when I was a kid I used to believe every word of those crazy stories of yours about Mars and Pellucidar. The inner world at the earth's core was as real to me as the High Sierras, the San Joaquin Valley, or the Golden Gate, and I felt that I knew the twin cities of Helium better than I did Los Angeles. 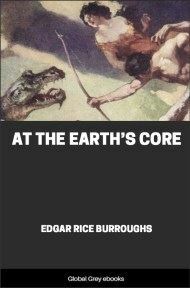 "I saw nothing improbable at all in that trip of David Innes and old man Perry through the earth's crust to Pellucidar. Yes, sir, that was all gospel to me when I was a kid." "And now you are twenty-three and know that it can't be true," I said, with a smile. "You are trying to tell me it is true, are you?" he demanded, laughing. "I never have told anyone that it is true," I replied; "I let people think what they think, but I reserve the right to do likewise." 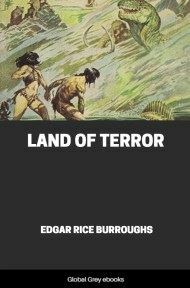 "Why, you know perfectly well that it would be impossible for that iron mole of Perry's to have penetrated five hundred miles of the earth's crust, you know there is no inner world peopled by strange reptiles and men of the stone age, you know there is no Emperor of Pellucidar." Jason was becoming excited, but his sense of humor came to our rescue and he laughed.